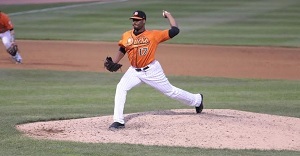 The 30-year-old left-hander Donnie Veal, who was in the major leagues earlier this season, has given the Long Island Ducks a boost lately with seven innings of relief spread over the same number of appearances in which he has allowed only one run and four hits while striking out 11. Veal also would like to think he will be back in the major leagues soon, but in the meantime is happy for the Atlantic League opportunity. Veal, who is listed at 6-foot-4, 235 pounds, was in five games with the Atlanta Braves earlier this season, and he also has pitched in four other major league seasons with the Chicago White Sox and Pittsburgh Pirates.